One of the many lovely things about being a Norfolk Food & Drink Festival Champion is it gives me a great excuse to get out and see a bit more of our wonderful county (not that excuses are really needed). The following is a quick review of just some of the trips I have enjoyed recently. Perhaps they will inspire you to seek out some of the delicious food and drink made by local producers – do let me know by posting a comment at the end. Regular readers will already know that I am partial to good pork pies and sausages. Some of the finest I’ve tasted are made by Karen and Jeff Nethercott from free range pigs reared on their smallholding in Pristow Green Lane. This is just 20 minutes from us in South Norfolk (15 minutes if the pies are hot out of the oven) – so when we heard they were having an open day we hurried along. The day started cold and damp but thankfully the drizzle stopped shortly after we arrived and by midday the sun was almost out. About a dozen local artisan producers had braved the weather to set up food, drink and craft stalls in the garden – and all were more than happy to chat about their work (although having tried the potter’s wheel, I think I will stick to writing for a living). We treated ourselves to some pies and sausages, naturally, as well as a jar of excellent Jubberwacky Chutney, a couple of bottles of Humpty Dumpty Ale and a slice of chocolate brownie (to share). We couldn’t stay for the music in the afternoon (Monday copy deadlines were looming) but before leaving we enjoyed a tour of the smallholding with Karen as our knowledgeable guide. 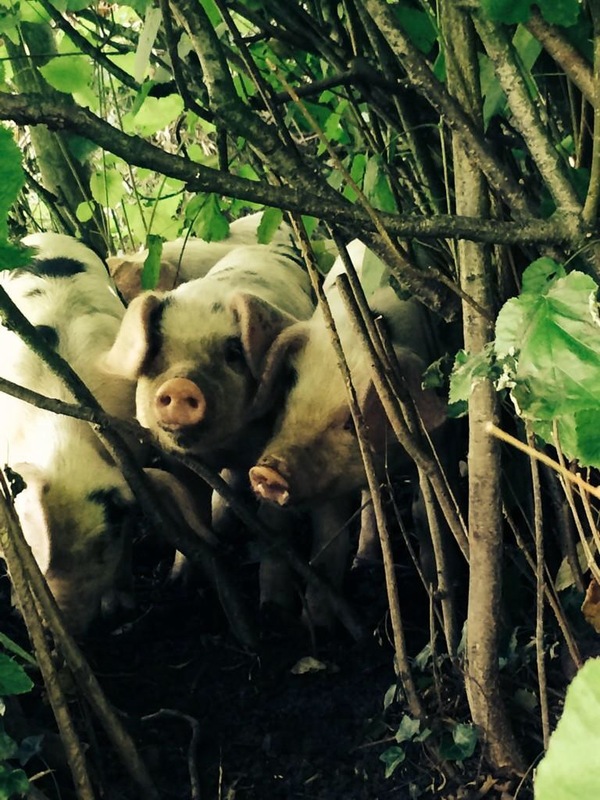 As well as rare breed pigs and sheep, Karen has a beautifully tended vegetable garden, a small orchard with various heritage variety fruit trees and a scattering of chickens and ducks. This might sound like the good life but I am sure it also takes a lot of extremely hard work to maintain. 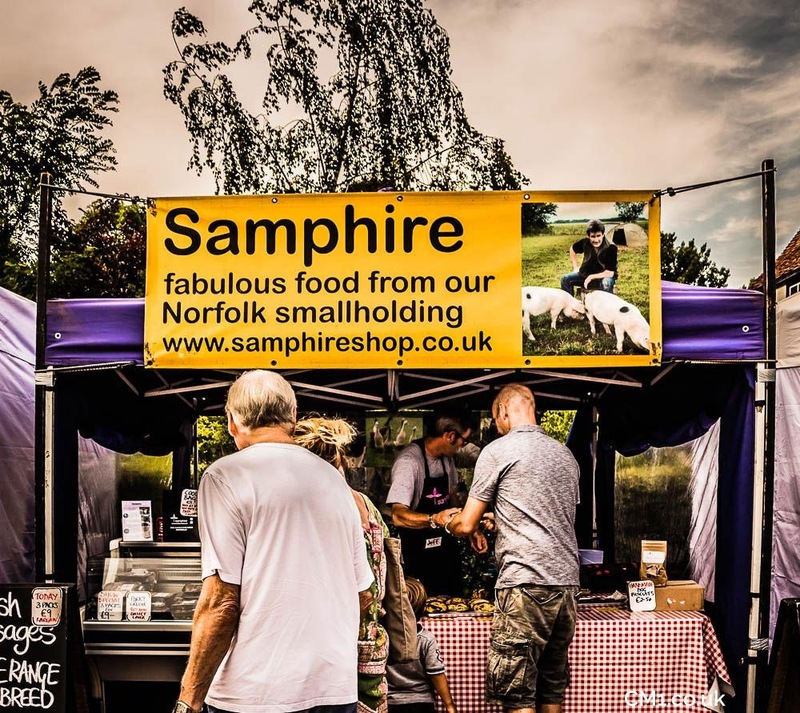 The pigs and sheep produce exceptionally tasty meat: partly because they are free range and partly because they are so well looked after, as evidenced by the RSPCA naming Samphire as a finalist in its Good Business Awards 2012. If you want to try some of Karen’s delicious food, you can buy online or from their stall at one of the half-dozen markets they go to. 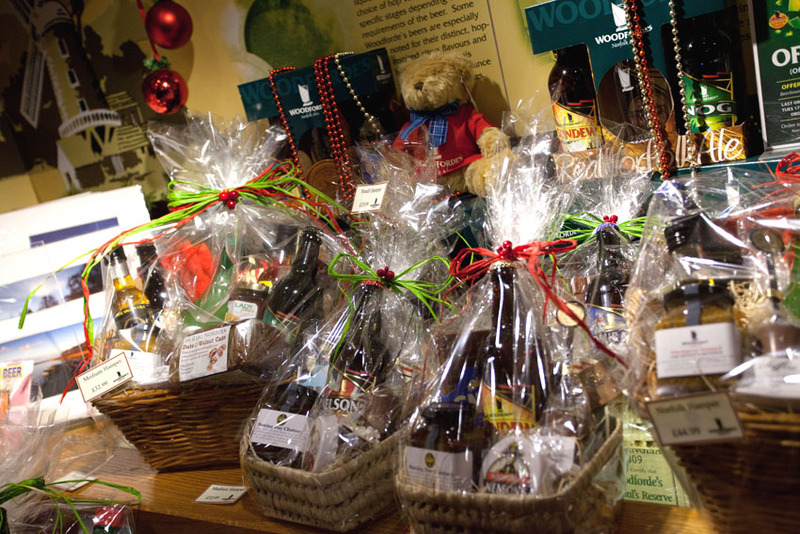 You will also find the pies served in local pubs and farm shops – just ask Karen on twitter for your nearest supplier. Thank you Karen and Jeff. 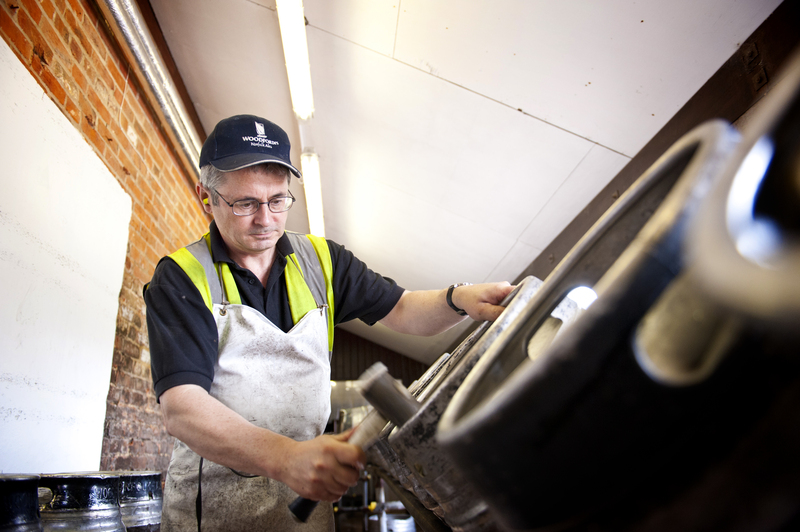 You may remember how in early July I visited Crisp Malting, in the pretty village of Great Ryburgh. On leaving I noticed a sign for the village shop and post office saying it was ‘owned by the community’. Intrigued, I popped in and asked for more info. There were three people working in the shop and they all turned out to be both residents and ‘shareholders’ in what is a Community Interest Company. The company was set up in 2008/9 after the pub, school, shop and post office had all closed in the space of a few months. It is now a successful social enterprise and – I am pleased to report – a keen supporter of local food and drink producers. From what I could gather, the villagers are justifiably proud of their achievement, which just goes to show what a community can do when it pulls together. I didn’t buy anything, other than a bottle of water, because it was a hot day and I had no way of keeping food fresh until I got home. This was a shame because I found out later that the shop stocks David and Julie Smith’s famed Perfick Pork sausages, which are made in the village. I also passed the Perfick Pork shop as I drove out of the village but (being a Monday) it was closed – so I may have to order some treats online. Driving back down the A1067 to Norwich I was reminded of another local foodie success story when I saw Algy’s Farm Shop. It’s worth reading Algy Garrod’s story on the website to understand his passion for making Norfolk Popcorn and supporting local producers – do pop into the shop, if you are passing Bintree, it really is lovely. Charlie Hodson, who is now Executive Chef at The Great Hospital in Norwich and a fellow Food & Drink Festival Champion, calls Algy one of his ‘food heroes’ and I can see why. That same Monday, I had to drive over to Lammas (errands and all that), so I took the opportunity to say hello to Tim Briscoe who runs the Buxton Potato Company. Tim’s family farm is only a few hundred acres but he has big ambitions. A few years ago he realised that simply selling his potatoes to wholesalers and processors meant he was missing out on the opportunity to add value to his product. He decided to start supplying local stores direct and to offer temperature controlled potato storage to other growers in the area. This all required some pretty substantial investment in high-tech bits of equipment (including solar panels to reduce his carbon footprint) as well as branding for his packaging – but it’s paying off. He now stores around 5,000 tonnes; washing, grading and packing up to 1000 tonnes for local supermarkets and shops and selling the rest to national chains via the Greenvale Co-op. Earlier this year the East of England Co-op named the Buxton Potato Company as one of the three finalists for its East of England producer of the year award (out of 130 entrants) and winner of the Norfolk heat. Look out for the Buxton Potato bags if you are shopping in North-East Norfolk. On Tuesday 8 July I had the pleasure of meeting Nick Stone (known to many of you as TypeJunky) who, aside from being a talented designer, is an ace photographer and walking encyclopaedia of local history. If you haven’t read Nick’s Invisible Works blog – take a look now, it’s fascinating. We took the opportunity to try out the new Little Red Roaster on St Andrew’s Hill and, as expected, the coffee and flapjack were delicious. That Saturday (13 July) we drove out to Foxley Wood for a fun and fascinating morning studying ‘Mighty Mini- Beasts’ with Norfolk Wildlife Trust. It’s a beautiful setting and only lacks one essential – a decent place to stop for coffee (do tell me if you know of one nearby). 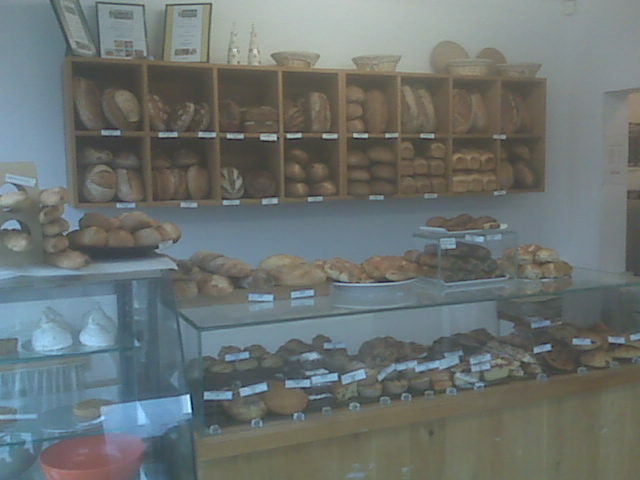 However, that gave us a good excuse to stop in at the wonderful Dozen Artisan Bakery on the way for fresh croissants to enjoy mid-morning – and excellent sourdough bread for sandwiches when we got home mid-afternoon. There you have it – a roundup of just some of the places we’ve visited recently and some of the excellent local food and drink we’ve enjoyed. Part 2 of this blog will look at some Norfolk visitor attractions which, while not being food focused, did not entirely disappoint on the refreshments front. Hope you enjoy both parts – do feel free to leave a comment below, it would be great to hear from you.